What a fine name for the dwelling of the Lord! What cool breezes and quiet solitude does that name invoke! The mountains that stand in a ring around the Nilayam look like hoary sages lost in contemplation. The broad sky inspires vast boundless musings; the rocks on top of the hills invite meditation. Sai Baba has planted a grove for religious austerities on the side of the hill behind the Nilayam; in that grove there grows a Banyan tree which is bound to become the holiest of such trees, at least so far as the seekers of spiritual uplift are concerned. The Banyan tree, known as Nyagrodha, "down-grown," and Vatavriksha, "enclosure tree," is famous in Indian sacred literature and history. Lord Maha Vishnu, the great God of Preservation, or Siva, God in the Form of the Guru, is described as sitting under a Banyan tree, and expounding by His very silence all knowledge to His disciple. This tree may be said to symbolize Sanatana Dharma, the Eternal Wisdom, for its branches reach out in all directions and draw sustenance from every type of faith and spiritual striving. It is also called Rahupada, "many-footed" in Sanskrit, for the series of roots that its branches send down toward the earth strike the ground and seek food therein and make the branches independent even of the parent trunk. The tree is therefore immortal. There are in India Banyan trees that have been worshipped for thousands of years, such as the one at Triveni at Prayag, Allahabad, or the one called Akshaya-vat, the "Indestructible," at Gaya. The Banyan that is growing in the grove has a peculiar sanctity of its own. In April of 1959, while talking one evening on the sands of the Chitravathi River to a gathering of devotees, Baba spoke of Buddha and the Bodhi tree, the "Tree of Wisdom," and of the Sadhakas (spiritual aspirants) seeking some specially favorable spots for their austerities. Even as He was speaking thus, He "took" out from the sands a thick copper plate about fifteen inches by ten inches in size which contained mystic markings and letters of many known and unknown alphabets! He said that such mystic plates, cryptograms written on copper or stone, are planted under trees where aspirants engage in austerities so that they may be helped to develop concentration of mind and control of the senses. He announced that He would be placing the copper plate under a Banyan tree that He proposed to plant in the grove. This was actually done on the twenty-ninth of June, 1959, and Sai Baba declared that Yogis who have reached a certain stage of spiritual progress will automatically come to know of this tree and this mystic plate, and they will be drawn by the mysterious force of these toward the meditation grove which will then fully justify its name! Picture: the mandir (temple) at Pransanthi Nilayam. The Prasanthi Nilayam was inaugurated on the twenty-third of November, 1950, the twenty-fourth birthday of Bhagavan Sri Sathya Sai Baba. It took about two years to build. Baba can be said to be the architect and engineer who directed the entire work for construction. His suggestions had to be accepted by the engineers, for they found them much better than their own. They recognized Sai Baba had a greater sense of perspective, a finer aesthetic point of view than they had. Baba was a hard taskmaster, but with immeasurable compassion. His Grace overcame the most insurmountable obstacles! For example, huge heavy girders for the central prayer hall came from near Trichinopoly by train to Penukonda, but how on earth could they be brought over the District Board Road, sixteen miles long with a sandy stream at the seventh mile? How could any truck with those things sticking out negotiate the acutely angled corners of the village on the ninth mile? After Bukkapatnam was reached, there were three miles of a track that can be referred to only by courtesy as a road; and then the broad expanse of sand which the Chitravathi River spreads across, a distance of three furlongs. There were the dilapidated culverts to be gone over, the slushes to be dragged through; and if and when girders arrived at the spot, the task of hoisting them on top of the high walls. The engineers gave up all hope of bringing the girders to the village and asked Baba for some alternative proposals for roofing the prayer hall. One night in the small hours the chief engineer was awakened by a loud noise in front of his house at Anantapur. He peered into the darkness and was surprised to find a crane from Tungabhadra Dam Works, put out of action and unable to move! He ran to Puttaparthi and told Baba that if only it could be made to operate, the owner could be persuaded to travel up to Penukonda and bring the girders along. Sai Baba materialized some Sacred Ash and gave a small quantity to the engineer who piously scattered it over the engine of the crane and asked the driver to make efforts to set it going. With a grunt or two, the engine started, the wheels turned, and the crane moved - toward the girders! Lifting them with its giant arms, it somehow passed over all culverts, turned acutely round the corners, lurched over the Vankaperu slush, and puffed up the Karnatanagapalli hill! There the engineer said its strength was nearly exhausted. It could not possibly draw all that weight through the sands. So Sai Baba Himself sat near the driver and handled the wheel, and the crane unloaded the girders near the work spot. The grumbling of the engineers did not stop with this achievement. In fact, they became even more exasperated. They asked, "Of what use is all this trouble when it is humanly impossible to hoist them on the walls?" Humanly impossible, yes, but where there is the Divine Will, there is a Way! Laborers were brought from the Tungabhadra Dam, ropes were fastened, pulleys were rigged up, and in order to make the girders lighter, each girder was pulled up amidst shouts of "Jai Sai Ram!" (victory to Sai who is Rama!) from the throats of hundreds of devotees in the Presence of Sai Baba. The girders were set in place and all went well! The central prayer hall with platform ensconced on either side is the main part of the Nilayam. On the westerly platform is the shrine where two life-size oil portraits are placed leaning against the wall, one of Sai Baba of Shirdi, and the other of Sri Sathya Sai Baba. There is also a silver figure of Sai Baba of Shirdi in the center and a small portrait of Sathya Sai Baba under it. These are kept as aids for meditation and the repeating of God's Name. Except for singing songs of God twice a day, once in the morning and a second time in the early hours of the evening, there is no regular worship as is generally done in places where an idol is installed and consecrated. There are no fixed rites and rituals which have to be performed on certain holy days, nor are there any schedules, prayers or worship which have to be performed. There is no rule that even the figure of Sai Baba of Shirdi should be there. The hall is a prayer hall, no more, no less, with the portraits of all the various manifestations of Godhead and of all the great spiritual and religious leaders on the walls. The rooms on the ground floor are mainly used for storing articles and vessels. There are two rooms set apart for private interviews granted by Sai Baba to devotees who come to Him. The rooms on the first floor are the living quarters for Baba. There is a large portico on the first floor from which He gives Darshan to the devotees thronging below and where He speaks on festival occasions. A charming marble image of Sri Krishna playing the flute is placed right in the center of the top floor of the portico. Everyone's attention is drawn toward its beauty and charm. There is a flight of steps which leads to the top terrace at the center of which, facing the approaching road, is a bust of Sai Baba, kept on a pedestal in front of the flagpole. Sai Baba gives Darshan from near this bust on days on which the flag is hoisted and He blesses the huge assembly with His Hand gesture of "Do not fear." The flag carries on it the representation of the symbol which Baba has materialized in the circle right in front of the building on the ground. In the very center of a series of concentric circles, there is a pillar which represents Yoga (union with God), with a number of rings to indicate the stages of Yogic discipline. This Yoga leads to the unfolding of the "Lotus of the Heart", whose petals are borne on top of the pillar. The next stage of this consummation of devotion and the blossoming of the heart is the "Flame of Illumination" and "Spiritual Light" symbolized at the top of the pillar. The first of the concentric circles and its intervening space is bare and sandy; the second one, planted with a bushy type of plant that grows in thick clusters which have to be occasionally clipped short, represents the qualities of desire and anger that have to be overcome in order to reach the Yogic stage, according to Baba. The first round, the sandy one, is the desert of desire, the waste land, the purposeless striving after evanescent things; the second, the one with the cluster plant, is anger, which is difficult to destroy, for as soon as it is clipped, it sprouts again. Then there are two steps, red in color, one low, the other a little higher, symbolizing hatred, which man also has to overcome. One type of hatred is caused when one is thwarted in the effort to achieve the desired object, and another type when pain is caused to one by the action of another. After these three are overcome, the circular space filled with green grass, cool to the eye, reminiscent of contentment and prosperity, represents Divine Love. This is the stage when the mind of man is filled with bliss, due to the absence of desire, anger, and hate, and having achieved the attitude of the state of "Being Equal Minded to All," the very basis of Divine Love. Soon the aspirant moves onto the open space of Peace, where he can sit at will and enjoy the fruits of the discipline he has gone through. The Yoga fructifies and takes him on from one height to another until the "Lotus of the Heart" blooms and the "Effulgence of Illumination" is assured at last. Around the circumference of the circle there are eight painted pots with flower plants, which Sai Baba explains as symbolizing the Eight Perfections or Divine Faculties which guard the Yogi. On the occasion of the ceremonial hoisting of the Prasanthi Patka, or the Flag of Peace, Baba generally expounds on the inner significance of this Lotus Circle and explains why He has it on the flag also. He advises and commands devotees to hoist the flag in their own minds and keep it flying aloft there, ruminating all the time on the lessons that it is intended to teach. Baba also speaks of the deeper meaning of the three gates to the prayer hall. The first, the outermost one that leads one into the compound, the one with the arch bearing the inscription of the name of the Nilayam, is the "Gate of Darkness." A person who crosses it leaves darkness, ignorance and inertia behind. He has nourished the holy thought of coming to the Presence, and the spirit of darkness and ignorance has fallen behind him. Those who are immersed in darkness will not even have the curiosity to enter! Then there is a second gate, just where the garden around the Lotus Circle begins. There one is attracted by the magnificence of the building, the electric tube lights, the coloured candelabras, the hanging flower pots, that is to say, the active and passionate aspects which appeal to individuals who are active and passionate. Next one comes to the very door of the prayer hall, "Gate of Wisdom," leading to the "Abode of Peace." The garden in front of the Nilayam is itself a tribute to the devotion of the devotees, for it is watered by long lines of devotees who pass the pots from one hand to another, thus bringing joy to the plants from the well behind the building. Sai Baba has made it a genuine botanical garden, for it contains fruit and flower trees from many different parts of the country and trees that do not ordinarily thrive in that particular climatic belt, such as the eucalyptus from Australia, the silver oak, orange, and coffee trees! The day begins at the Prasanthi Nilayam with the ringing of the prayer hall bell at 4:30 a.m., announcing the Divine Moment or period when devotees must prepare for meditation and the repeating of God's Name. At 4:45 the singing of Om begins in the hall and continues for about half an hour, followed by silent recollection of the Name until 6 : 00 in the morning. The syllable Om is extolled in the Upanishads as the best and most effective symbol of God. It contains three Sacred Holy Sounds. A, U, and M, as well as the soundless stage where the sound of Om rings into the silence and makes the disciple feel the communion with God, as the consummation of the contemplation of Om is the attainment of "Pure Consciousness." The waking state in which the soul is dominated by darkness and is engaged with the gross physical body, is represented by the letter A. The dreaming state in which the soul is dominated by the quality of activity and passion and is engrossed with the subtle body, is represented by the letter U. The state of deep sleep which finds the soul in a state of inner wisdom dominated by goodness and truth, represented by the letter M. The waking and dreaming states merge in sleep. 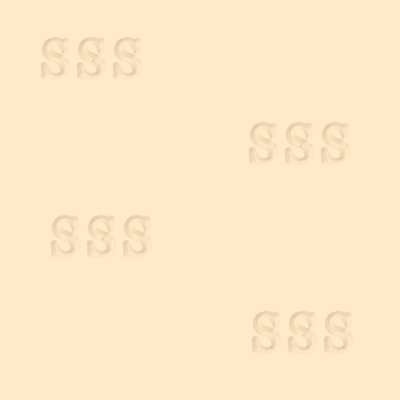 The fourth state of the soundless Om represents the state of the self per se. The significance of Om is often explained in public speeches and private conversation by Sai Baba. Om is also repeated before and after each Adoration Session, since it is the one great all-inclusive representative of God, non-sectarian and universally accepted. Sai Baba also constantly emphasizes the need for meditation with the repeating of the Name of God as an essential discipline for everyone. He gives detailed instructions and guidance to everyone who is eager to practice them. So there are at the Prasanthi Nilayam many devotees who engage in this type of worship for many hours a day. While Sai Baba is at the Prasanthi Nilayam, He is engaged all the time in the task of blessing devotees, giving them chances of seeing His Grace, contacting Him, making obeisance, and conversing with Him. He eats the simple food of the poorest of the land, food cooked and brought with devotion by the devotees at the Nilayam. He sleeps on a bed spread on the floor. He sits on a chair placed generally on a platform in the west portion of the hall during the singing of songs of love to God, and He gives Darshan to all in the hall. He allows them to touch His Feet whenever He comes down to the hall. The morning hours resound with the powerful chants of the wisdom writings of ancient India. These are repeated in the prayer hall during consecration and worship with the Thousand Names of God. The Sivalingam (Siva emblem), was "taken" for this purpose out of the sands of the river Chitravathi, November 1958. In the evening during most of the year, the Bhagavatha, Ramayana, or other great religious texts are expounded for about two hours by learned pundits. Everyone who comes to the Nilayam has the supreme advantage of earning an interview with Sai Baba before departure from Puttaparthi. It is given individually if they have come alone, in a group if they have come as members of a family. Perhaps no other Divine Manifestation has poured out so much Grace! Baba is the Divine Physician, diagnosing the ills of the supplicant and laying bare the innermost blemishes of character or conduct with the utmost kindness, applying the soothing balm of His Grace for the prescription of appropriate remedies. The Interview Room at Puttaparthi has been the scene of countless transformations of character, revolutions of belief, confirmation of faith, curing of disease, calming of temper, discarding of hatred, salvaging of souls, and reunion of hearts. Seldom does a person leave after the interview with a dry eye. Sai Baba gives to everyone hope and courage, contentment and faith, assurance and solace, because He says, "Why fear when I am here? Put all your faith in Me. I shall guide and guard you." The songs of love to God sung in the prayer hall are highly elevating experiences, for the atmosphere is one of serene reverence. Baba Himself is generally present in the hall at such times. On rare occasions, when He feels so inclined, He sits with the devotees and teaches in His entrancing manner various ways of singing the Names of God. "The father might be a Ph.D., but when he puts his son through the alphabet, he has to take up the slate and write on it the letters, A, B, C and D; but one does not infer that the father is learning the alphabet," says Baba. The songs are not all about Sri Sathya Sai Baba or His previous appearance as Sai Baba of Shirdi. They cover the widest possible range of the truths of the various manifestations of God through the ages. They are sung in the languages of Telugu, Tamil, Kannada, Hindi, and Sanskrit. Emphasis is on the meaning and the "emotion of surrender." They are sung in unison and to the correct marking of time. Sai Baba has often expounded on the loud singing of the Lord's Name in unison as an act of service to others. He has compared the loud clapping of the hands in time during singing to the clapping of hands under a crow-infested tree in order to frighten the birds away! "The noisy crows of desire and hatred in your minds can be driven out by the loud clapping of hands as an accompaniment to the ecstatic repetition of the Lord's Name," says Sai Baba. 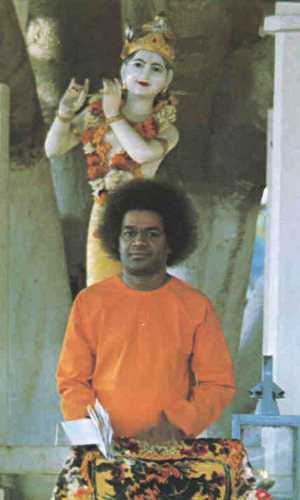 Baba exhorts everyone to engage himself in the repetition of the Name of the Lord. Any Name that appeals to the individual is, in His eyes, as good and effective as any other. Baba has composed numerous songs for the edification of His devotees. Many of these summarize in simple Telugu, Kannada, or Tamil, the spiritual disciplines that every mortal must adopt so that the purpose of this human episode may be realized. For example, there is one song which asks all to plod through the pilgrimage of life with Truth, Righteousness, Peace, and Love as inseparable companions and guides: "Effort and endeavour is the duty of man; success and failure depend on the Lord's Grace. Engage yourselves in your allotted task every day with the consciousness of the living Presence of the Lord always by your side. Do not yearn for the eight attainments or you may be lost in mere delusion. In this thick jungle of life hold fast to His Name; that is enough. Cultivate well the heart which is your farm; the mind is the plough; the qualities of inertia, action, and balance are the bullocks; take up the whip of discrimination and start the ploughing of your heart! Courage is the best of all fertilizers; the seeds that you sow must be the seeds of Divine Love; devotion is the rain; emotions are the weeds; the harvest is the merging in the Universal itself!" The prayer sessions at Prasanthi Nilayam are gatherings of holy seekers who become purified by instruction and strengthened by inspiration from Baba directly and through these songs. Formerly Sai Baba used to take the devotees out almost daily to the sands of the Chitravathi River, and prayers were held there under the stars with the hills as venerable listeners and the river murmuring response. He does so occasionally even now. Sitting on the sands, Sai Baba teaches the devotees new songs He has composed for their elevation and edification, and He encourages people to ask Him any questions regarding spiritual matters, for which He gives satisfying answers. It was November 1949 when the author reached Puttaparthi one morning about half past nine and found an atmosphere of exultation pervading the temple (the Prasanthi Nilayam was then half completed). Everyone was talking about Sai Baba's going to the river sands that evening. Congratulations were received for being on time for the visit to the river sands with Baba. About half past five that afternoon Baba came out of His room and walked briskly at the head of a large throng of visitors, scattering joy all around Him by His very Presence and making many a quip and joke, pleasantry or inquiry. Stepping across the tiny trickle to which the river had been reduced, He trudged along the sands seeking a place clean and dry for the party to sit. After proceeding about two hundred yards, He decided on a site, and all sat around Him, the men on one side, the women on the other, as is always the custom at the temple. Sai Baba waited graciously until the oldest and the weakest of the devotees reached the spot and were comfortably seated. Then the discourse began. In reply to a question from a devotee as to whether Karma (activity) has to be given up to attain Liberation, Sai Baba gave a sweet simple exposition on the sublimation of all Karma through the attitude of dedication to the Lord. This attitude would take away the craving for the fruits of action and loosen the bonds of attachment which produce sorrow and rebirth. Devotion, devoid of Karma - mere love without acts through which it is expressed - is like a basement without a wall. Karma without devotion is like a wall without a basement! Baba said during His discourse, "I am the Servant of everyone. You can call Me by any Name, I will respond, for all names are Mine. Or rather, I have no particular Name at all. Even if I am discarded by you, I shall be with you. In My view, there are no atheists at all; all are existing by and for the Lord; denying the sun does not make it disappear." After this discourse Baba taught a few songs, and then a question turned the proceedings to another topic. This time it was about Sai Baba of Shirdi, "the previous body," that He spoke. He described the features of Sai Baba of Shirdi and derided all types of pictures now being circulated as incorrect caricatures. Even while he was saying this, He dug His Fingers into the sands, and instantly there in His Hand was a fine picture which He showed to everyone present as the authentic portrait representing Sai Baba of Shirdi as He really was! He gave the picture to one of the devotees present. Conversation naturally moved on to Baba's being a manifestation of Dattatreya, "the Unity of the Trinity." Again Baba's Fingers went into the sands, and lo, there came into His Hand a charming metal image of Dattatreya. In their excitement all had now gathered closer around Sai Baba, and He felt that each of them must receive something from Him and return happy. He therefore "took" out from the sands a thick flat block of sugar candy which He broke into pieces and distributed personally to every man, woman, and child (for as He said, if anyone else did the distribution, there would not be enough for each!). He then took a handful of sand and poured it onto a plate. As He poured, it became Vibhuti, the Sanctifying Ash! This He gave to all present. Sai Baba is so fond of these open-air prayer sessions and discourses, that He takes the devotees to the river bed or seashore whenever one is within reach. Baba has held prayer sessions and discussion groups of this nature on the sands of the Godavari, the Kaivalya, the Swarnamukhi, the Vaigai, and other rivers, as well as on the banks of the Ganges, the Jhelum, and the Yamuna. He has also sat with devotees on the seashore of Madras, Tranquebar, Masulipatam, Cape Comorin, and Kovalam, and performed miracles of turning the sand into pictures, images, Vibhuti, or whatever He wanted it to become! Generally, Sai Baba takes the devotees to the sands on festival days. On the festival day in honor of the birthday of Lord Krishna or perhaps on the preceding day, He very often visits the sands and sometimes "takes" from the sand an image of Krishna which is displayed in the hall on the actual birthday of Lord Krishna. Afterwards it is given to a devotee to be worshipped in his shrine at home. Also on Rama's birthday, or perhaps on the previous day, Baba "takes" from the seashore or river bed, depending upon where He is at the time, images of Rama. Near Kalahasthi He "took" such images from the Swarnamuki River of more than usual size, and they are kept at Venkatagiri and offered worship regularly in that city. During the evening of the Heavenly Eleventh Day of the Moon, He has for many years been regularly "taking" Divine Nectar for distribution among the devotees while in the midst of prayers or discourses on the river bed or seashore. For example, on December 21, 1958, during Baba's Kerala Tour, He went to the Kovalam Beach, seven miles away from the town of Trivandrum, accompanied by many devotees. At a quiet spot on the seashore, a mile away from the bathing area, Baba sat with the devotees around Him, and sang a few songs which were followed by a prayer session. During the session Baba "took" from the sands a bewitching sandalwood image of Lord Krishna playing the flute, and after a few minutes He "took" a gold ring with the Krishna motif embossed on it! Everyone expected that Baba would distribute amrita, "nectar of immortality," "taken" by Him from nowhere. They were not disappointed, for even as the devotees sang, the fragrance of the nectar was wafted in the still night air and no one knew from where! Baba's Palms became sticky, as if saturated with syrup, even while beating time for the songs. All knew that the fragrance was then emanating from those Palms. He held His Palms together and pointed them at a silver vessel. Thick ambrosial "honey" flowed into it from His Hand! He distributed it Himself to all present, including some fishermen who had joined the group. The sweetness and scent of the nectar were incomparably strange and outside the experience of everyone. 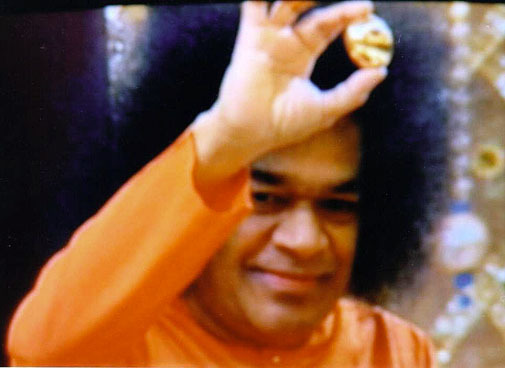 On the Telugu New Year's Day, Sai Baba generally distributes the traditional mixture of "bitter-sweet." On the Pongal Day the cattle of Nilayam are decorated and taken in procession; the villagers come up to the temple for worship when the cane-crushing season starts and the extractors are about to be operated. The devotees delight when they are granted the chance of celebrating initiations, marriages, and other scriptural rites in the immediate presence of Sai Baba and in the Nilayam itself. The platform on the eastern end of the prayer hall is generally used for such religious functions. On Deepavali Day, the Day of Victory over the Forces of Evil, Baba takes delight in firework displays and also distributes strings of firecrackers and color matches to the children of the devotees at Nilayam as well as to the children of the village. He sends New Year messages of assurance and admonition on January first to devotees who have earned the blessing. On His birthday He often sends birthday blessings to devotees. Three festivals are celebrated every year at Puttaparthi, and they are attracting increasingly larger and larger throngs from wider and wider areas. They are, first, the Dasara, the holiday celebrating the triumph of right over wrong; second, Mahasivaratri, the Night of worshipping God Siva; and third, the birthday of Sai Baba, which is celebrated every year on the twenty-third of November. The Dasara has been celebrated from the very announcement of the manifestation. In the early days prayer and worship were performed every day and Baba was adorned with ornaments, rings, necklaces, and crown, and taken in procession in a palanquin, each day decorated in different styles. The climax was reached on Vijayadasami, the "Tenth Day, the Day of Victory." Within a few years, Baba emphasized the religious and spiritual significance of the worship of God as Mother; so the character of the celebrations took on a new phase. Worship by all women devotees twice a day, and the performing of music, poetry, drama, and other arts gained a place in the worship of the Mother as the Goddess of Learning. Some idea of the festivities can be gained by going through the program which was printed and sent to the devotees. For example, the celebrations for the 1958 Dasara began with the Flag Raising Ceremony on the morning of the first day. The devotees gathered in solemn silence around the Lotus Circler, and to the sound of bells, Sai Baba unfurled the flag. On many occasions He has explained the inner meaning of the symbol of the lotus that is in front of the Nilayam, as well as on the flag. Worship of God by all women devotees begins at noon and is performed twice daily for the ten days. The second day is set apart for social work by the devotees - repair of the approach road, cleaning of the place where the poor are to be fed on a subsequent day. In the evening the devotees listen to discourses by Sai Baba and experienced social workers about the proper attitude and the need for doing Karma, activity, suffused with and nourished by devotion. The third day is the Children's Day with sports and fancy dress, drama and recitations by the children. Sai Baba makes all the children happy and at ease, persuading them to proceed when they forget their words, caressing them into confidence. Baba gives prizes to each child participating, and these become the pride of the family. On the fourth day, the Poets' Assembly is held in the immediate presence of Baba. Poets from far and near recite and expound in such languages as Telugu, Tamil, Sanskrit, Kanada, and English. They too are the proud recipients of presents which are highly valued because they are given with so much kindness and by a person who is Himself the Kavi, the "Divine Seer." Baba blesses the devotees with His discourse on two or three days during Dasara, thus giving the thousands who come, something to live by, some capital to carry home and invest in daily life. The sixth and eighth evenings are devoted to devotional singing. On the seventh day, the poor are fed and clothes are distributed to the maimed and destitute. Someone asked Sai Baba why news of this mammoth function, in which about four or five thousand persons are given clothes or saris, did not appear in any newspaper. Baba replied, "I wonder why it should! When your kith and kin come to you and you feed them, do you invite the press and crave publicity?" Sai Baba appears happiest that day of all days, and it can be said to be His busiest day. He examines the kitchen and the preparing of the dishes and supervises the seating arrangements. Bending before the out-held leaves, He serves the sweets to almost everyone. He walks along the lane of the needy and selects those to whom clothes are to be given. Tickets are issued and names are later called out. Those in need walk up to Baba and receive from His Hands the coveted present. It is an inspiring sight and a very heart-warming experience. He has a kind word for everyone. He treats the blind, the maimed, the very old, and the faltering with special consideration, asking the young to aid and guide them. He advises them to be careful and cautious in the dark and fashions kind inquiries about them. He makes the moment precious to everyone. Once the rains melted away the brightness of the festoons in front of the Nilayam during the first three or four days of Dasara. Baba wanted the decorations to be renewed in time for the Day of the Feeding of the Poor. He said, "They are our most distinguished guests, and the temple should appear bright and cheerful when they come." That is the attitude He teaches the devotees to adopt. The other days of the festival are devoted to music recitals, vocal, instrumental, or orchestral. Many musicians compete for the privilege of appearing on these festival days, because Baba Himself is the Great Musician who sings in a captivatingly charming style. They are eager to win His blessings. On Vijayadasasmi Day, ritual bath is performed to the image of Sai Baba of Shirdi, and Baba generally materializes a lingam and places it on the head of the image prior to the rite. Siva has a Tamil appellation meaning, "He who became also the Mother". As the story goes, He once attended a woman during the delivery of her child, since the midwife who was hastening to attend her could not reach the place because of the floods in the Cauvery River. Therefore Siva assumed the form of the midwife, reached the place in time, and nursed her as a midwife would! Sai Baba has been the Mother many times. He has often taken upon Himself the labor pains and has also "gone out" of His Body to act as midwife during delivery. Women in far off places have felt His Presence and He has referred to it at Puttaparthi, explaining that He had set right the posture of the infant before the delivery so that the event might be without pain. There was a lady in a hospital whose baby had died on the sixth day due to her umbilical cord's being improperly cut. The wound became septic and the mother's life was endangered because the placenta had not been removed and could not be, due to the septic conditions. The worst was expected. Aware of this, Baba at Puttaparthi "went out" of His Body and was gone for an hour. Two hundred fifty miles away at the hospital, the placenta came away, the temperature dropped, and the mother began to recover. Joy dawned again on the faces at her bedside. Baba said when He returned to His Body, that He had been to the hospital and had presented the Vision of His Hand to the patient. On the third day a letter came from her describing the Vision and the cure. In 1950, on the day for worshipping the renowned Lakshmi, the Goddess of Love and Harmony, Baba accepted worship and received the offerings made by the women who had fulfilled those particular vows. Those who had this unique good fortune say that He actually appeared to them dressed in sari and blouse and resplendent with bangles, necklaces, nose stud, and ear ornaments! No wonder the Dasara, Ten-nights Festival when Devi, the Goddess, is worshipped as the Goddesses Durga, Lakshmi, Sarasvati, Annapurna, Tripurasundari, Lalita, and other forms, is attracting thousands to Puttaparthi where "Mother" Sai is so beneficent and bountiful. Siva-ratri, "the Night of the Siva," is also an equally important festival. The devotees perform all night vigil with prayers and songs of love to God with Baba's Presence reminding them of Siva Himself. A profusion of Ash emanates from Baba's hands, forehead, toes, and face, and He liberally blesses with Ash all types of erring humanity. Since 1950, Siva-ratri has been celebrated at Puttaparthi, and each year since the declaration of the manifestation, Sivalingams have materialized within His Body. They are then generally placed on the image of Sai Baba of Shirdi, and after the celebrations end, are given by Baba to devotees to be worshipped according to instruction. Such lingams have been worshipped now for over sixteen years. The lingams that emanate on successive Siva-ratri days differ in number, size and composition. Sometimes only one is formed; the material is apparently sphatika, gold, or silver. Often times there are more in number - three, five, seven, or nine! They are about an inch and a half in height. All are complete with the base and are marked with the three horizontal lines symbolizing Vibhuti, Sacred Ash. This producing of the lingams is indeed a unique and mysterious manifestation of the Divine Will. When we describe the manifestations of His Will, we should not fail to pay homage to the Personification of that Will, Baba Himself. He is the "Abode of Peace" wherever He is and whenever He is worshipped, remembered, or called upon with devotion. When a devotee requested the members of an assembly which Baba had just addressed at the Gokhale Hall in Madras to go to Puttaparthi and join the wonderful devotional singing at Prasanthi Nilayam, Baba immediately corrected him and said, "No, no. You can be where you are. I shall come to you. Do not put yourself to the expense which you may not be able to afford. If you call upon Me, I shall be at your side." A medieval Kannada poet has sung that the distance between God and us is just the distance that our call will reach. Believe in Him and call on Him; He will answer, "I am here." One can call on Him by any of His Names. 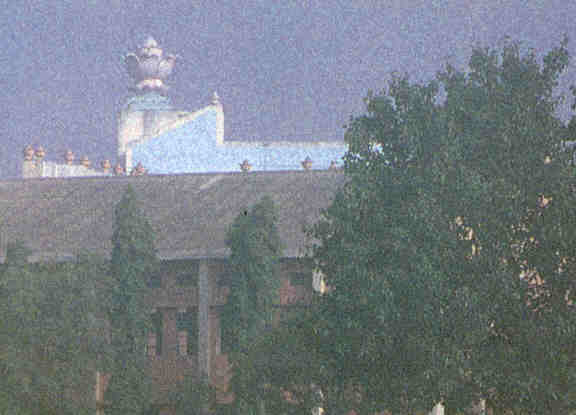 In October 1957 a hospital was inaugurated on the hill behind the Nilayam. It contained six beds for female patients and six beds for male patients, a full complement of equipment for surgical and maternity cases, and a room complete with an x-ray unit. It commands a magnificent panorama of surrounding mountains which sweep to the very banks of the Chitravathi River. Baba chose the site in spite of murmurings of engineers, because as He said, the patients would be inspired by the Lord's handiwork before their eyes. He got bulldozers, cut and leveled three terraces where there was once a rocky side of a hill, and planned the hospital on the topmost terrace. Speaking on the occasion of the Foundation Stone Laying Ceremony, He said that everyone, rich or poor, educated or uneducated, pious or not pious, was subject to disease. Because there were no good hospitals for miles around, and more importantly, as an example of the service which the Lord Himself performs in order to make man do likewise, and thus earn the Grace the Lord, Baba said He planned the hospital at Puttaparthi. He also said that those who come to the hospital for their physical ills will naturally turn to Prasanthi Nilayam for the treatment and cure of their spiritual ills also. Baba supervised the construction, acquiring of equipment, and watched over the devotees who, standing in long queues along the slope of the hill, passed from hand to hand metal, stones, bricks, water, mud, mortar, and everything needed for the structure that dominates the landscape today! On the first annual celebration the Medical Officer in charge spoke of many miraculous recoveries that had happened through the blessings of Baba. Baba said that it was due to the spirit of love and service with which every stone and brick of the building was saturated. Sai Baba, when visiting the hospital, persuades the patients to take medicines or undergo injection or surgery. The sweetness of His words and healing influence of His looks hasten recovery. Baba often has many things to teach the doctors in charge. He is Himself the Great Physician and Surgeon. He gives practical advice on the maintenance of mental equanimity and physical wholesomeness by the methods of repeating the Divine Name of God and meditation which keep the entire personality in balance. Case reports published in the Nilayam magazine are invaluable for medical practitioners, for they reveal how desperate illnesses are cured by the healing influence of the Divine Grace that presides over this hospital. While ardent devotees of Sai Baba are content to leave the welfare of their physical frames to His will, there are some who, on His advice, take as a curative the Sacred Ash that He gives or the medical treatment He recommends. As Baba says, He does not recommend the same prescription for all. Just as a doctor might prescribe four different types of treatment for four different patients suffering from stomach-ache, Baba also recommends different remedies for different patients. He is the Great Physician. To the right and left of the Nilayam, beyond the garden and behind the building, are a number of dwellings where devotees live. 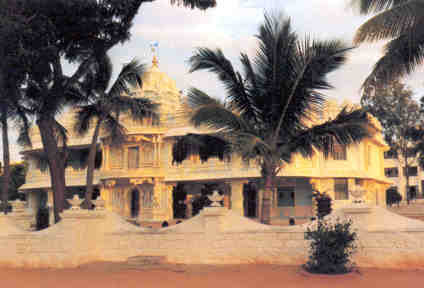 When the residents are away, these living quarters can be made of use by others who come to Puttaparthi. Baba directs and guides every item of work at the Nilayam, and devotees eagerly await His instructions. While traveling by car, and when seeking a place for breakfast or lunch, He selects locations which are gems of beauty - among the eucalyptic slopes of Nilgiri or Kodaikanal Hills, the pine corridors of Kashmir, the arid plains of Bellary, the green carpets of Seringapatnam, the coastal coconut gardens of Kerala, the Palmyra avenues of Tinnevelly, the canal bank near Samalkot, or the igneous fields of Raichur. He draws the attention of those around Him to a beautiful sunset or sunrise, the captivating panorama of a clouded sky, or a ring around the moon. "Andame Anandam," meaning "beauty is bliss," is often on His Lips. Baba is also a great lover of cattle. The cowshed at Prasanthi Nilayam is a model for farmers of the surrounding villages. He spends many hours with the cows, feeding and nursing them; He decorates them on Pongal Day and has a scintillating variety of ornamental pieces for this purpose. For some time he had a horse, as well as stags, deer, peacocks and rabbits which were blessed to receive His loving touch and tenderness. 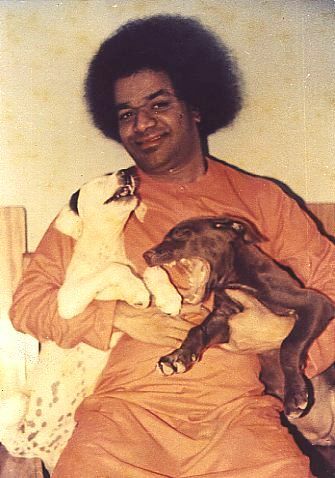 Baba also has had a number of dogs as His pets. The story of these dogs is an interesting episode of the Lord's care and mercy. Jack and Jill, two Pomeranians from Cotacamund, were the first of the canine pets. Baba says they used to fast every Thursday as if by some holy compulsion! And they could never be induced to consume flesh! Jack used to sleep at the head of Baba's bed and Jill at the foot. After three years of being in His Presence, Jack breathed his last, lying on Baba's lap. His end was worthy of his life. The previous night Jack had followed a car which had to be parked far away from the Nilayam. He lay quietly under the car, unknown to the occupants, for he had a way of volunteering to keep watch over the cars. His tiny bark used to keep off the village urchins. Early in the morning when the car moved off, Jack was nearly killed. He mustered sufficient strength, said Baba, to drag himself along the river bed back to the Nilayam. With a great final effort he pulled himself onto the lap of Baba. With his eyes glued on Baba's face and his tail shaking feebly with joy, Jack concluded his brief but blessed earthly career. Jill could not live alone; she followed him in a few weeks. Both are buried in the quadrangle and a structure for growing a holy plant has been built over their mortal remains. Chitty and Bitty, Lilly and Billy were other Pomeranians that followed. Then there Were the Cocker Spaniels, Minnie and Mickie, as well as Honey and Goldie. Baba had these for some years and later gave them to devotees. He inquires even now about their welfare. Baba has had some Alsatians too, Rover and Rita, who were later followed by Tommy and Henry. These animals have received the tenderness and love of Baba in great measure. We to whom the animal world is different have to learn this lesson while observing His affection for them - never harm animals for the sake of sustenance or pleasure, and always look upon all created things as belonging to the one family. Sai Baba speaks of the element of destiny and says that if some animal or man earns His Grace, it is due to destiny. He always adds that His Grace can be earned by spiritual practice or disciplined life, self-control, selfless service to all, because each man symbolizes Narayana, "God in man." Just as an examiner judges the answers of the papers of candidates, the Lord too values our achievements. If the answers reveal earnest study and an active interest in the subject as well as a grasp of the methodology of the science involved, the examiner will understand even a poor performance so far as the actual answer material is concerned. It has been the experience of some devotees that they are unable to go to Puttaparthi in spite of their tremendous efforts. But more often, as soon as the devotees plan a visit, everything becomes easy. Leave, money and companions become available quickly and all obstacles are removed. Baba says that without His will, no one can start the journey to Puttaparthi; he cannot reach the place where Baba is. His Omniscience and Omnipresence are revealed to everyone who meets Him in the Interview Room. He tells the visiting devotee what he has said, has done, or has felt; to whom he has spoken, and on what; what he has feared and plotted, suffered and lost. If you want to consult Him on ten points, He will have answered them and more even before you ask! He might reveal what you actually experienced in your dreams, repeating the very words which in the dream you had heard Him say. He may even lay bare your history down to the minutest detail, and where there was sorrow and weakness, He will replace it with joy and strength. "He is tireless in His ministry of compassion," says Principal H.S. Rao. "Baba's words do not merely soothe, but open up new levels of consciousness and reveal hidden strength and goodness of one's nature. The seeker is enabled by His Grace to know himself, to realize more keenly his duties, responsibilities, and even shortcomings. All this He does in the most natural way, patting you affectionately on the back. His eyes alight with a merry twinkle, and speaking so that you can understand. There is such power in what He utters, such depth of conviction, that you are left speechless at the Omniscience of Baba and His miraculous perception of your individual problems and needs." Thus the teachings given at Prasanthi Nilayam rebuild mankind; thus does the Presence of Sai Baba urge mankind onward.